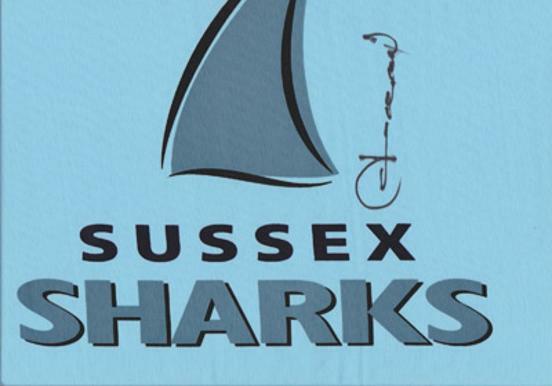 Autographs include: Gehan Mendis, Garth Le Roux, Paul Parker, John Barclay, Ian Gould, Allan Wells, Colin Wells, Ian Greig, Tony Pigott + 4 others. 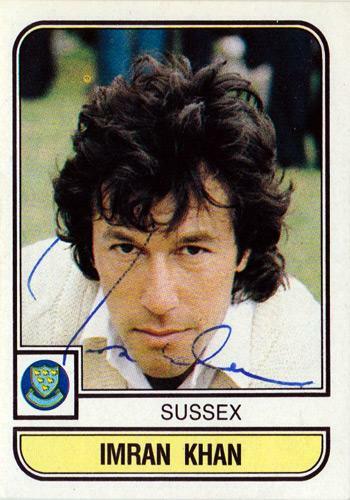 Picture approx A4 size (cut from a newspaper). 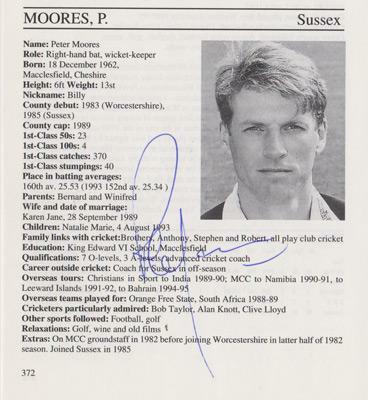 Signed WCM Man of the Month page 1. 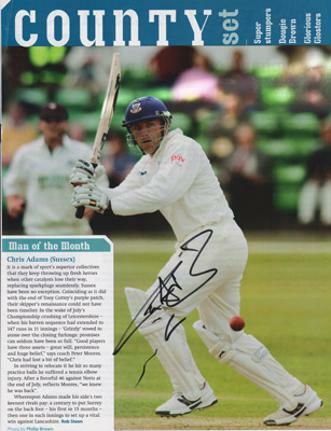 Signed County Set Man of the Month page 2. 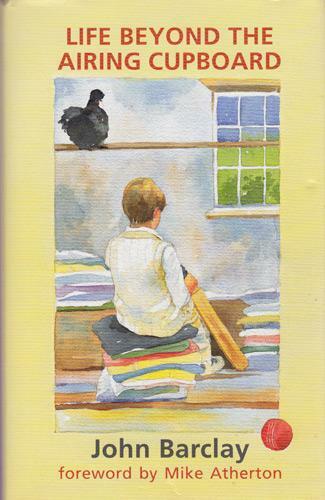 Signed 2008 biography "Life Beyond the Airing Cupboard" with handwritten message and dedication. 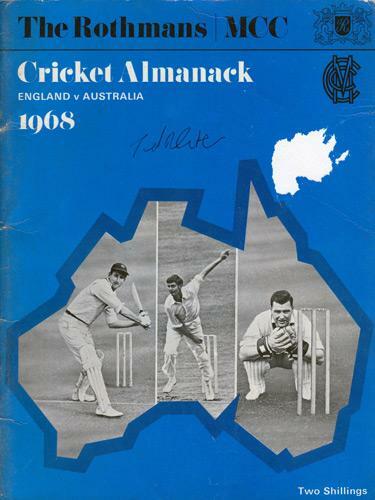 "The Year of the Trout"
Signed "1968 Rothmans / MCC Cricket Almanack - England v Australia" booklet. 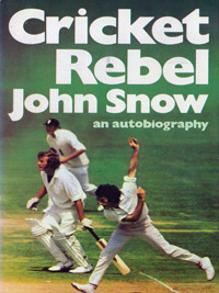 Has some slight damage to front cover. 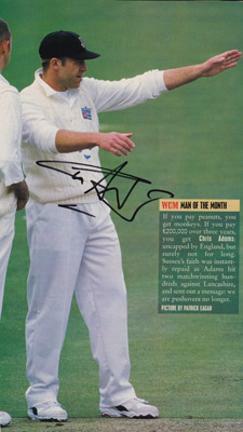 Signed World Series Cricket magazine pic. 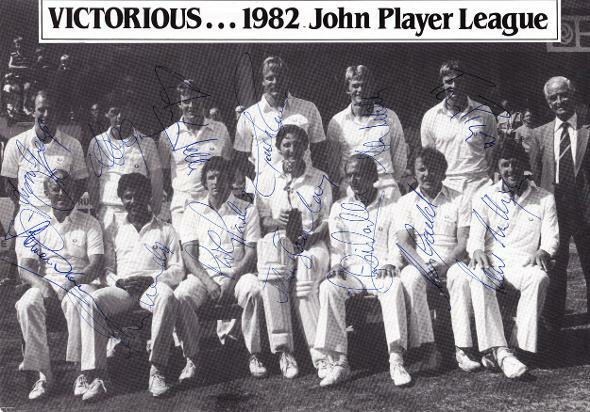 Signed B&W England Test match pic. 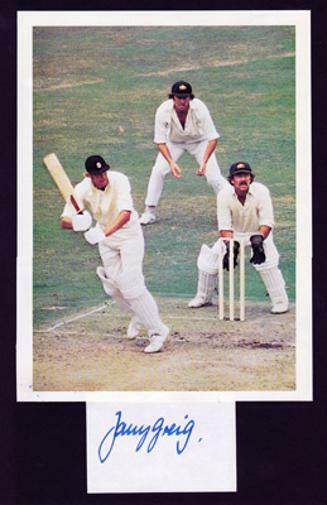 Autographed colour mag pic batting for England v Australia. 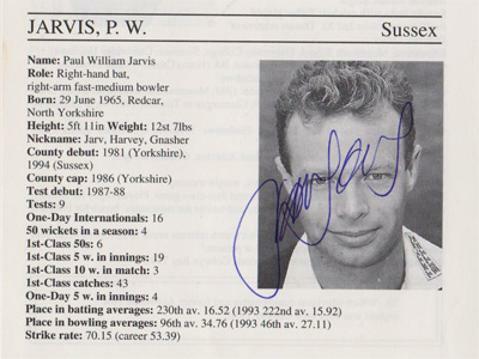 Signed Times newspaper full page featuring pic celebrating his sixth wicket for England against South Africa wrapping up victory. 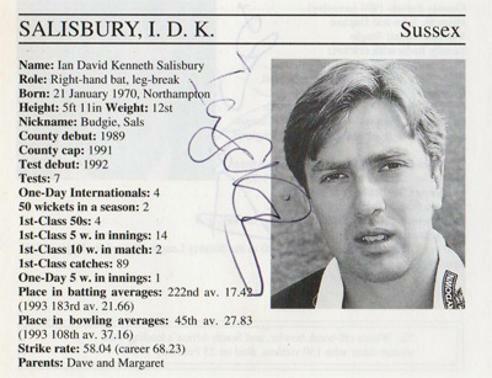 Signed Cricket magazine page featuring Kirtley amazing one-handed diving catch to dismiss Sourav Ganguly in a 2002 ODI v India at Lord's. 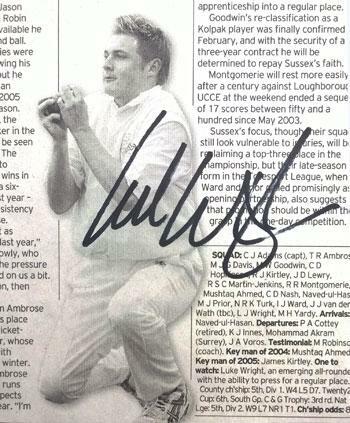 Signed small Cricket magazine pic. 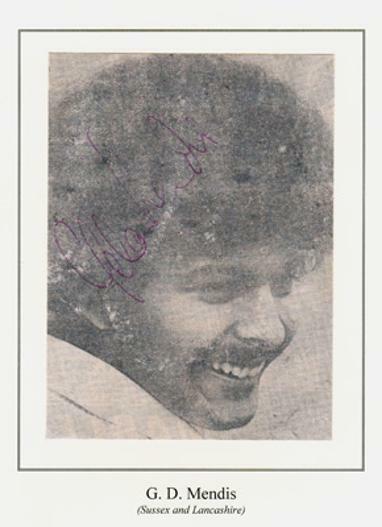 Signed small Player Trading Card. 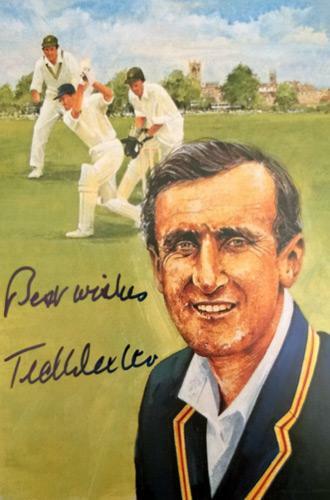 Signed magazine colour portrait pic. 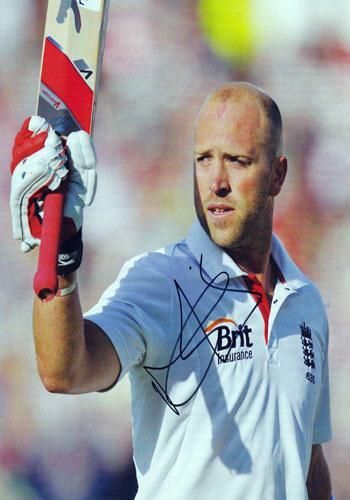 Signed B&W Portrait pic mounted on card frame.. 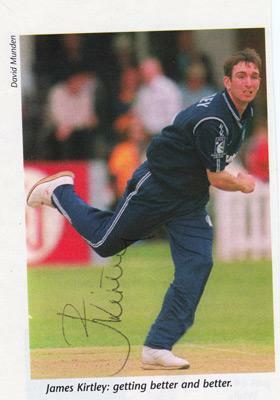 Signed small colour mag pic celebrating a wicket. 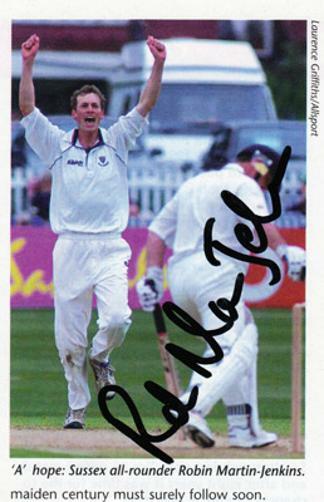 Signed small B&W pic RMJ clean bowling Devon Malcolm en route to career best figures of 7-51. 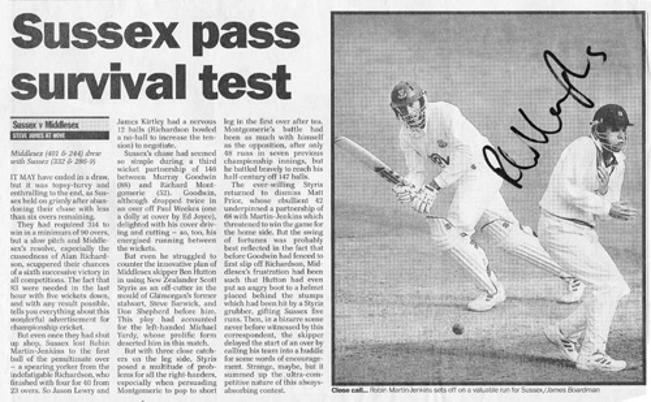 Signed B&W newspaper report Sussex v Middx with pic of RMJ batting. 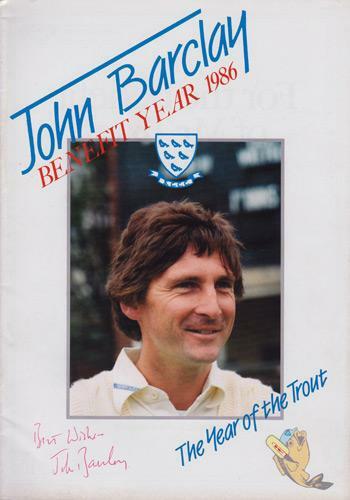 Signed 1998 Benefit Year First Day Cover Commemorative. 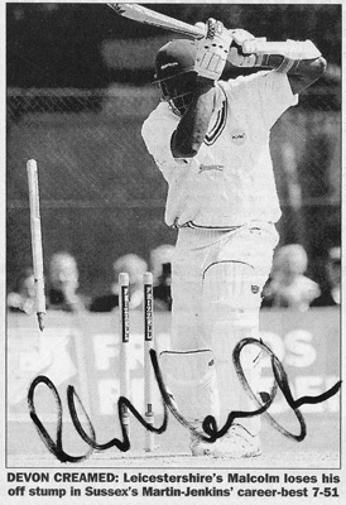 Signed newspaper pic of him being clean bowled by Waqar Younis. 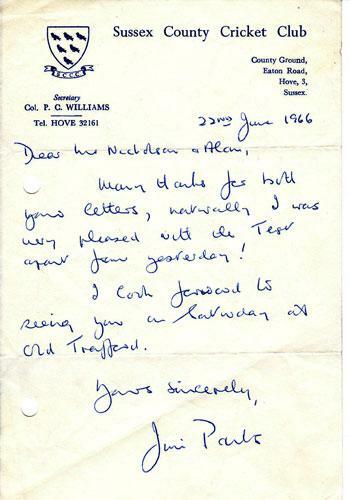 Hand-written & signed 1966 letter on Sussex CCC letterhead paper. 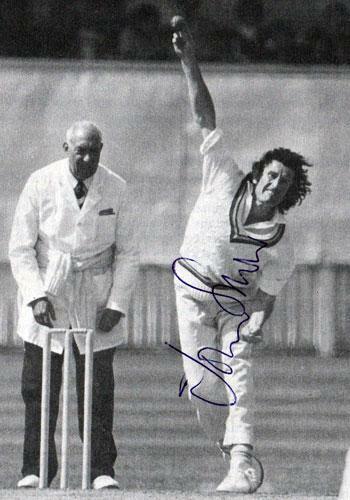 Signed Test Match colour magazine batting pic. Signed County Scene South magazine preview feature. 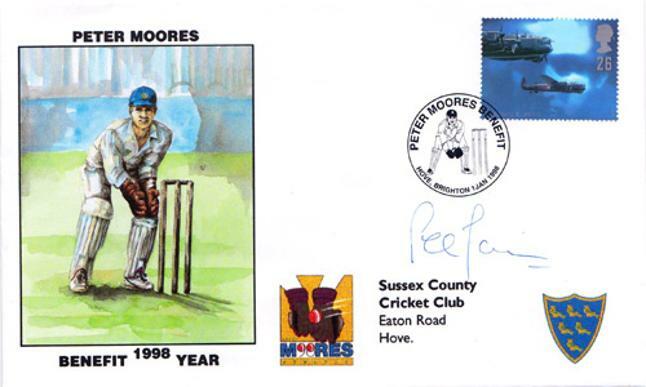 Signed colour magazine pic batting for Sussex. 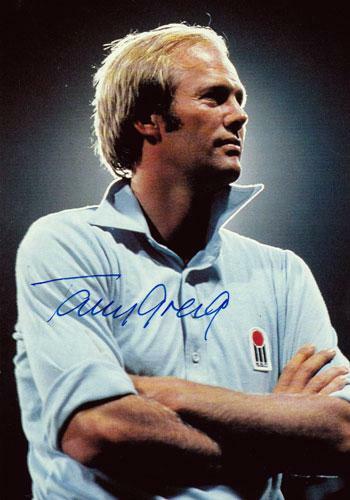 Signed England Squad pen pic & bio. 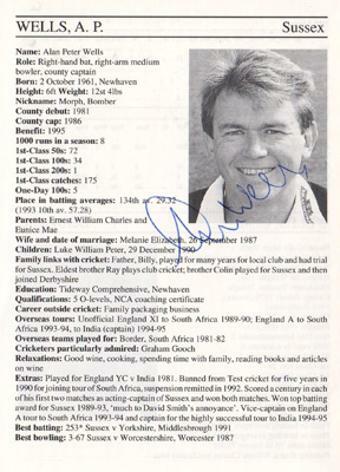 Signed 1995 "Who's Who" bio entry & portrait pic. 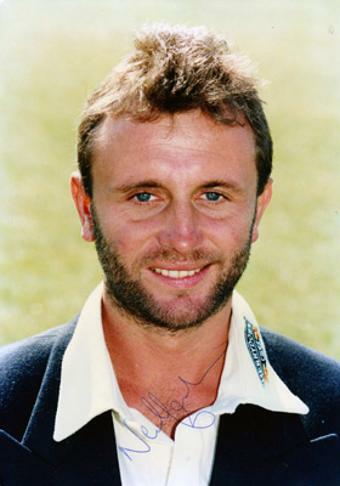 Smith captained England once in South Africa in 1889 taking seven wickets in the victory including 5-19 in the first innings. 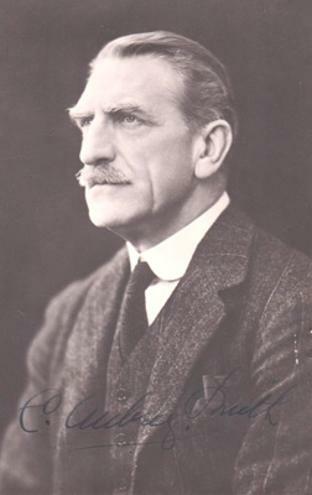 Smith became a distinguished actor in Hollywood appearing in The Prisoner of Zenda, Rebecca, Dr Jekyll and Mr Hyde & Tarzan the Ape Man. 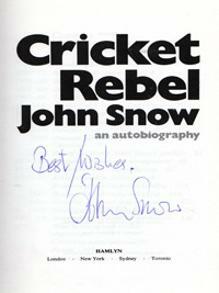 He also founded the Hollywood Cricket Club in 1932. 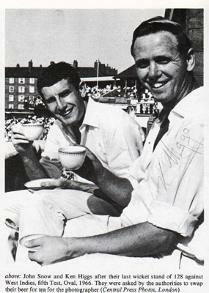 Ken Higgs (Leics CCC) has also signed a B&W pic of him and Snow drinking tea. 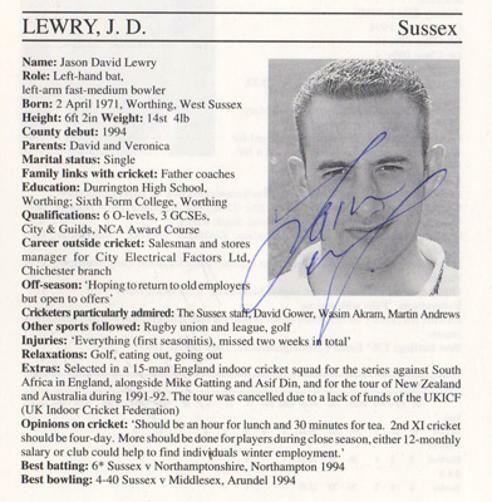 Signed 1995 "Who's Who" biography page. 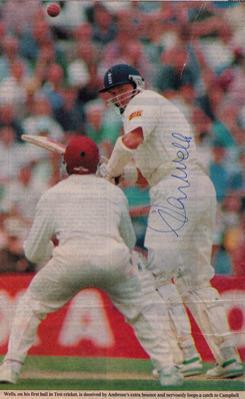 Signed colour newspaper pic of Wells being dismissed for a first ball duck on his England Test debut - caught Campbell bowled Ambrose. 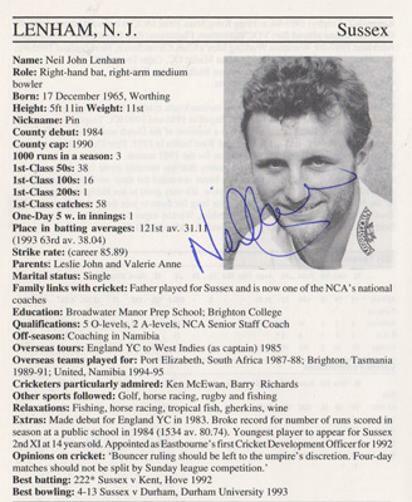 Signed "One to Watch" England player feature. 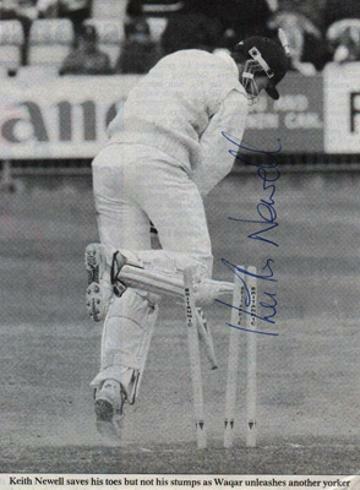 Signed B&W newspaper pic of Yardy batting for Sussex.